It has been a very busy week since I last wrote. I've been trying to balance the business of getting ready to return to New Mexico with spending time with my family. I'm trying to focus on all the goodness and not on the fact that I won't get to see my grand babies again until January or February. I have jokingly said I have postpartum depression. I continually remind myself that I must look forward, not back. my scrap squares quilt top is assembled and ready for its backing and quilting (I am undecided if I will hand quilt it or not). I've not been the only one busy around here. 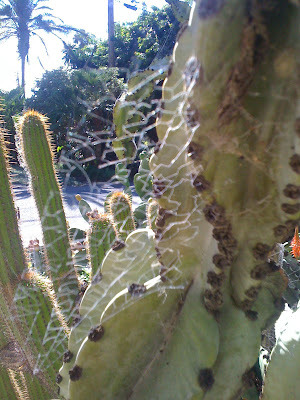 There is some spider I have yet to see that is happily setting up camp all over my big euphorbia plant in the front yard. It's a web unlike any I've seen before...it goes in little strips, and reminds me of the edging one gets from using a serger. Maybe I should remember this for a good machine quilting pattern; nothing like inspiration from nature!